1 The economy and jobs: Americans’ views of economic conditions are more positive than they have been in recent years. An October survey found 41% of Americans rating economic conditions in the country as “excellent” or “good,” near the highest point in a decade. The public’s improving economic outlook is reflected in its policy agenda for Trump and Congress in the coming year. 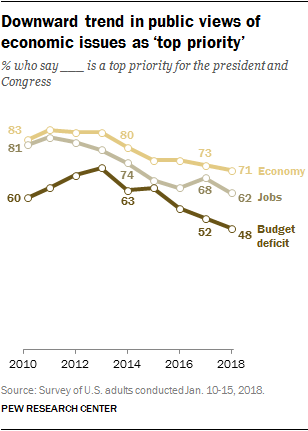 Economic issues – improving the job situation, strengthening the economy and reducing the budget deficit – are now viewed as less important policy priorities than they were just a few years ago, according to a survey conducted earlier this month. The public’s view of local job availability has also improved substantially in recent years. In October, half of Americans said there are plenty of jobs available in their communities – the highest assessment in Pew Research Center surveys dating to 2001. Despite the public’s brighter outlook on jobs, however, there has been little change in the share of Americans (49%) who say their family’s income is falling behind the cost of living. 2Taxes: The public has mixed expectations for the tax law recently passed by Congress and Trump. About as many say the law will have a mostly positive effect on them and their families (29%) as say its effect will be mostly negative (27%). A third of U.S. adults expect the law to not have much personal impact. Views also are split on how the law will affect the country as a whole, with 35% saying it will positively impact the nation and 40% anticipating a mostly negative effect. Just 15% say the law won’t have much effect on the country. These views vary by party and income. Those with higher incomes are more likely to say they will personally benefit from the new tax law. 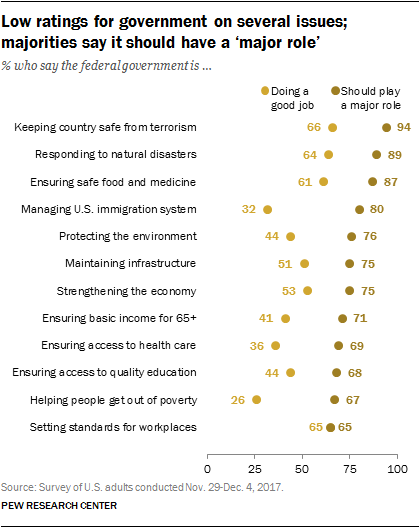 3 Terrorism and global threats: Defending against terrorism continues to rank among the public’s leading priorities for the president and Congress, with nearly three-quarters (73%) saying it is a top priority. Majorities in both parties agree that ISIS, North Korea’s nuclear program and cyberattacks from other countries pose “major threats” to the U.S., according to a survey conducted in October 2017. But there are partisan differences on other perceived threats. For example, Democrats are far more likely than Republicans to see Russia’s power and influence as a major threat (63% vs. 38%). The large partisan gap on views of Russia only emerged after the 2016 presidential election. For several years before that, Republican and Democratic views about the threat posed by Russia were generally similar. 4Foreign policy: The public is evenly divided over whether the U.S. should “be active in world affairs” or “pay less attention to problems overseas and concentrate on problems here at home” (47% each), according to a July 2017 survey. The share favoring U.S. global involvement has increased from 35% in 2014, the last time this question was asked. A partisan gap has emerged on this question as Democrats increasingly say the U.S. should play an active role globally (56% say this, up from 38% in 2014). When it comes to dealing with U.S. allies in global affairs, 59% of Americans say the U.S. should take into account the interests of its allies, even if it means making compromises with them; 36% say the U.S. should follow its own national interests even when its allies strongly disagree. While 74% of Democrats say allies’ interests should be taken into account, 54% of Republicans say the U.S. should follow its own interests when there is strong disagreement. 5 Immigration: Most Americans say immigrants strengthen the country with their hard work and talents (65%), rather than say that immigrants burden the country by taking jobs and other resources. Public views of immigrants have moved in a more positive direction over the past several years. Two issues central to the current immigration debate – the status of immigrants brought to the U.S. illegally as children and expansion of the U.S.-Mexico border wall – have very different patterns of support among the public. Nearly three-quarters of U.S. adults (74%) favor granting permanent legal status to immigrants brought here illegally as children, and just 37% favor substantially expanding the wall along the U.S.-Mexico border. There are substantial partisan differences in views of both policies. However, while Republicans and Democrats are on opposite sides of the issue of expanding the border wall (72% of Republicans favor, 85% of Democrats oppose), among both Democrats and Republicans more favor than oppose permanent legal status for immigrants who came to the U.S. illegally as children (50% of Republicans and 92% of Democrats favor this). 6Trade: Amid negotiations over the quarter-century-old North American Free Trade Agreement (NAFTA), Americans generally express positive views of the trade pact. Most Americans (56%) say that, all in all, the agreement is good for the U.S., according to an October survey. But Republicans are more likely than Democrats to say the pact is bad for the U.S. (54% vs. 18%), and to say that it benefits Mexico more than the United States. In recent years, partisans have moved apart in their assessments of free trade agreements in general, as Republicans have generally grown more negative in their views. 7Health care: Despite repeated efforts by congressional Republicans to repeal the 2010 health care law known as the Affordable Care Act, more Americans see the law as having a positive effect on the U.S. than a negative effect (44% vs. 35%), according to a survey conducted in December. The share of Americans saying the law has had a positive effect on the country has increased 20 percentage points since 2013. The same survey found that 69% of Americans say the federal government should play a major role in ensuring access to health care. Yet only 36% say the government is doing a very or somewhat good job at ensuring health care access, down from 56% in 2015. 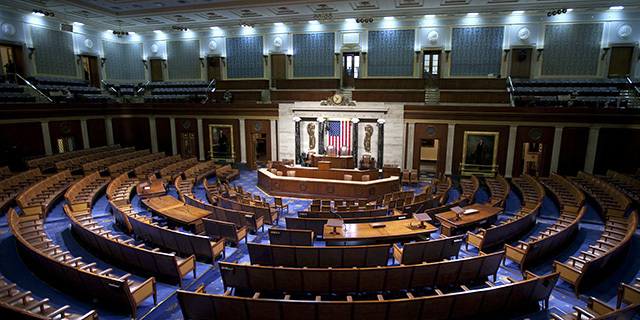 9Environment: While partisans agree on some assessments of what Trump and Congress’ top priorities are, climate change and the environment are among the most divisive. Nearly seven-in-ten Democrats (68%) say dealing with climate change should be a top policy priority, 50 percentage points higher than the share of Republicans who say so (18%). And while 81% of Democrats say protecting the environment should be a top priority, just 37% of Republicans say the same. There is also an increasingly wide partisan gap when it comes to environmental laws and regulations. In July 2017, 77% of Democrats said stricter environmental laws and regulations are worth the cost, while 58% of Republicans say such regulations cost too many jobs and hurt the economy. 10 Race relations: Nearly a year into Trump’s presidency, a majority of Americans (60%) say his election has worsened race relations in the United States. Three-in-ten say Trump’s election has not made a difference when it comes to race relations, and just 8% say his election has made them better. Just after Trump’s election in 2016, nearly half of Republican voters (48%) said they expected his election to lead to improved race relations. Roughly a year later, just 17% of Republicans say it has. 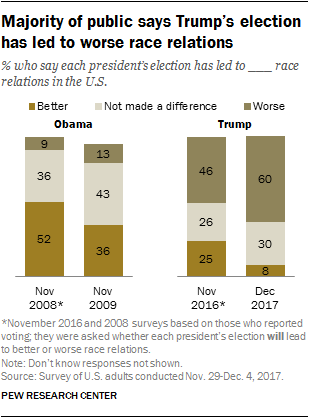 Meanwhile, about eight-in-ten Democratic voters (83%) say Trump’s election has made race relations worse, little different than the share who expected his election to lead to worse race relations in November 2016 (81%). Opinions about the overall state of race relations in the country remain more negative than positive. Today, just 38% say race relations are generally good, while 56% say they are generally bad. Note: See full topline results on importance of State of the Union and policy priorities here (PDF).